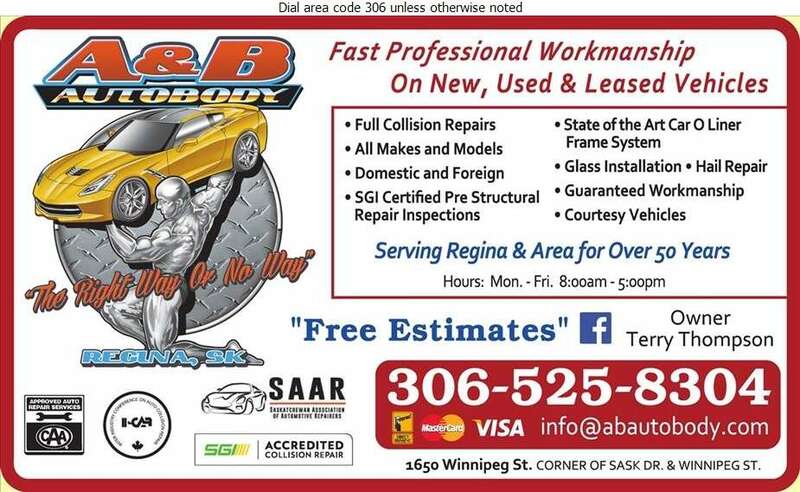 Serving Regina and area, A & B Autobody Ltd. is the shop to bring your damaged vehicles. We deliver fast professional workmanship on new, used and leased vehicles. Our journeymen auto body specialists provide full collision repairs on all makes and models of vehicles, whether domestic or foreign. At A & B Autobody, our auto body specialists perform SGI certified pre structural repair inspections. A & B Autobody believes in doing repairs, "The right way or no way". We guarantee our workmanship. Bring your damaged vehicle in for a free estimate today. We are located at the corner of Saskatchewan Drive and Winnipeg Street or call for an appointment at 306-525-8304. I just got my vehicle back and it looks amazing!! The work was done right and quickly! If you need work done, take your vehicle to Terry! He will make sure it's done right!